Spanner Crabs have elongated shells, which is very broad at the front. The first legs are "spanner" shaped and the rest are flattened and have numerous short bristles. The spanner crab's body colour varies from orange to red. Spanner Crabs prefer bare sandy areas. They inhabit intertidal waters to depths of more than 100m, from sheltered bays to surf areas. Spanner crabs remain completely buried in the sand for most of the day, but they emerge rapidly when food appears. Spanner crabs are opportunistic feeders, ie., they eat what ever is available. Adults eat heart sea-urchins and a variety of small bivalve molluscs, crustaceans, polychaete worms and fish. Spanner crabs are often found in areas where there is an intensive night time prawn fishery, suggesting that discards from the trawl catch may form a significant part of their diet. There is evidence that sharks and turtles feed on spanner crabs and turtles take advantage of crabs being caught in nets. Spanner Crabs are available wild-caught, these marine dwellers are found from close inshore to at least 100m, usually buried in sand from where they attack small bottom-dwelling fish. Their long, almost goblet-shaped, bright orange shells (even when uncooked) and spanner-shaped front claws are quite distinctive. Found around most of the Australian coast from NSW north to southern WA, they are caught commercially, mainly using dillies, but also as a bycatch of Prawn trawling, off southern Queensland and northern NSW. The fishery has increased greatly since the early 1980s. Did you know? 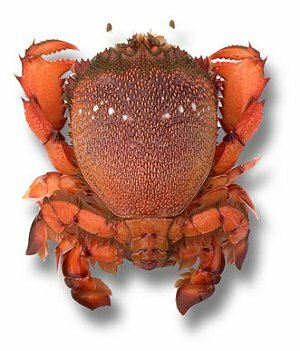 Spanner Crabs move in a forwards-backwards motion, unlike other crabs who move sideways. Did you know? 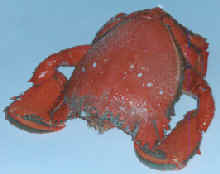 This large crab is red in colour and stays the same colour when cooked. Spanner crab meat is coarser in texture than other species and known for its sweet flavour. They average about 400g and are usually sold cooked, although they can occasionally be found live. Although they only yield 25% meat, they are lower priced than other Crabs and some chefs prefer their distinctive flavour. This low- to medium-priced crab species offers many cooking alternatives and adds a delicate crab flavour to a variety of dishes. When this crab is cooked whole, its bright orange shell is very attractive served on a buffet or platter. For Asian-style cooking, spanner crabs make excellent clear consommes or Thai-style broths, and are a good choice as an ingredient for won tons and dumplings. Spanner Crabs are caught commercially, mainly using dillies, but also as a bycatch of Prawn trawling, off southern Queensland and northern NSW. The fishery has increased greatly since the early 1980s. 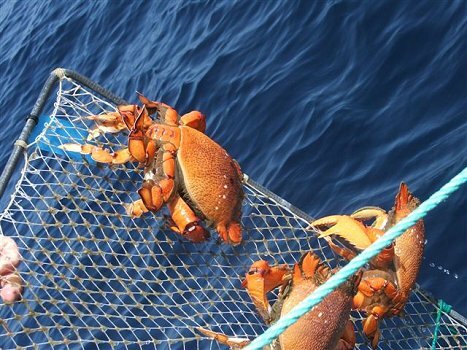 Commercial spanner crab fishers are required by law to use dillies - frames with netting stretched across them - no more than 1 metre square in size. A bait bag containing three or four bait fish is attached to each dilly. Ten or 15 dillies are clipped to a trotline by a short rope at about 50-metre intervals. Each trotline is marked by a flagged buoy. Spanner crabs are harvested all year round, except during a one-month spawning season from 20 November to 20 December. Most of the Queensland catch is taken in deep oceanic waters south of Yeppoon. Exporters, Importers, Processors and suppliers of Spanner Crab are listed.